And it has a crappy cover. That's an absurd price for a game I've never even heard of. Individual companies submit the game they want to be Deal of the Day, and what price they want to sell it at. you have to wait your turn, and smaller companies with fewer sales have to wait longer, but it's a powerful marketing tool. It's also fairly new, and most companies haven't gotten more than one deal yet 9and several haven't even had their first deal run), so I suspect most companies are still trying to decide what to do with it.
. . . I think I got my hardback copy of that game for less than what they're charging for the PDF. Yikes. And a shame, too, as it's basically "Syndicate" the RPG - at a different price point and with better exposure it has/had a chance to be a niche success. It always seemed to be chasing the old pre-POD, big publisher model though, right down to an impressive amount of splat-book churn despite the game's relative size. I'm betting the prices are a part of that - it very, very much seems keyed to the price point of quote unquote "real" rpg publishers like WoTC, OP, Catalyst or the like. Again, sad though, because SYNDICATE THE RPG - how many cyberpunkers cut their teeth on those games? The math is wrong....that is not 60% off. Looks to me like something is glitching (badly) on their listing...I've seen this happen before. Anyway it's currently listing the price as $15.32. 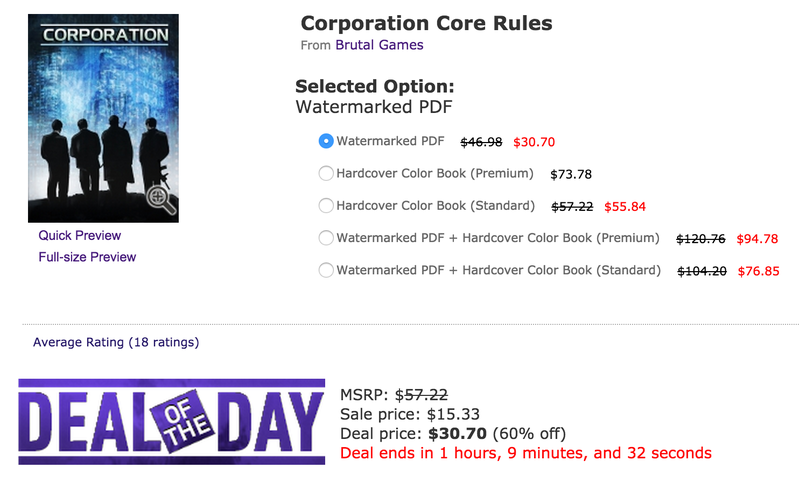 I've never been quite able to take the leap and buy a copy of Corporation, though....maybe if they did a deal for $5. The sale is over and the PDF is now $54.79, with hardcovers starting at 79.39 up to 142.97. Something must be wrong with the automated system.